To close out the month of April, I’m happy to share news of the event that the group will be conducting next month to launch Windows Server AppFabric and BizTalk Server. On May 20th @8:30 pacific, we will be kicking off the Application Infrastructure Virtual Launch Event on the web. The event will focus on how your current IT assets can harness some of the benefits of the cloud, bringing them on-premises, while also connecting them to new applications and data running in the cloud. Yefim will discuss the latest trends in the application infrastructure space and the role of application infrastructure in helping business benefit from the cloud. In addition to the keynotes, there will be additional sessions providing additional details around the participating products and capabilities that we will be delivering in the coming months. Folks who would likely get the most from the event are dev team leads and technical decision makers, as much of the content will focus more on benefits of the technologies, and much less on the implementation and architectural details. The Application Infrastructure Virtual Launch Event website is now live at http://www.appinfrastructure.com/ – today, you can add a reminder to your calendar and submit feedback on the topic you are most interested in. On Thursday, May 20th, at 8:30am Pacific Time, you can use the URI to participate in the virtual launch event. When you write the product documentation you learn all kinds of cool inside tips about how to use it. In this episode, Michael McKeown shares 10 tips for troubleshooting using the dashboard. Be sure to check out the AppFabric Wiki for more great tips, and to share yours as well. Windows Workflow in .NET 4 (WF4) includes a new set of messaging activities to help you build web services that are implemented with workflows. In this episode, our guest is Dave Cliffe, Program Manager for the messaging activities. Wondering how and why these activities work the way they do? Then tune in and learn something… For more check out my blog, and the WF team blog as well. Data Web Control Enhancements in ASP.NET 4.0: Scott Mitchell has a good article that summarizes some of the nice improvements coming to the ASP.NET 4 data controls. ASP.NET MVC 2: Basics and Introduction: Scott Hanselman delivers an awesome introductory talk on ASP.NET MVC. Great for people looking to understand and learn ASP.NET MVC. ASP.NET MVC 2: Ninja Black Belt Tips: Another great talk by Scott Hanselman about how to make the most of several features of ASP.NET MVC 2. ASP.NET MVC 2 Html.Editor/Display Templates: A great blog post detailing the new Html.EditorFor() and Html.DisplayFor() helpers within ASP.NET MVC 2. MVCContrib Grid: Jeremy Skinner’s video presentation about the new Html.Grid() helper component within the (most awesome) MvcContrib project for ASP.NET MVC. Code Snippets for ASP.NET MVC 2 in VS 2010: Raj Kaimal documents some of the new code snippets for ASP.NET MVC 2 that are now built-into Visual Studio 2010. Read this article to learn how to do common scenarios with fewer keystrokes. Turn on Compile-time View Checking for ASP.NET MVC Projects in TFS 2010 Build: Jim Lamb has a nice post that describes how to enable compile-time view checking as part of automated builds done with a TFS Build Server. This will ensure any errors in your view templates raise build-errors (allowing you to catch them at build-time instead of runtime). VS 2010 Keyboard Shortcut Posters for VB, C#, F# and C++: Keyboard shortcut posters that you can download and then printout. Ideal to provide a quick reference on your desk for common keystroke actions inside VS 2010. My Favorite New Features in VS 2010: Scott Mitchell has a nice article that summarizes some of his favorite new features in VS 2010. 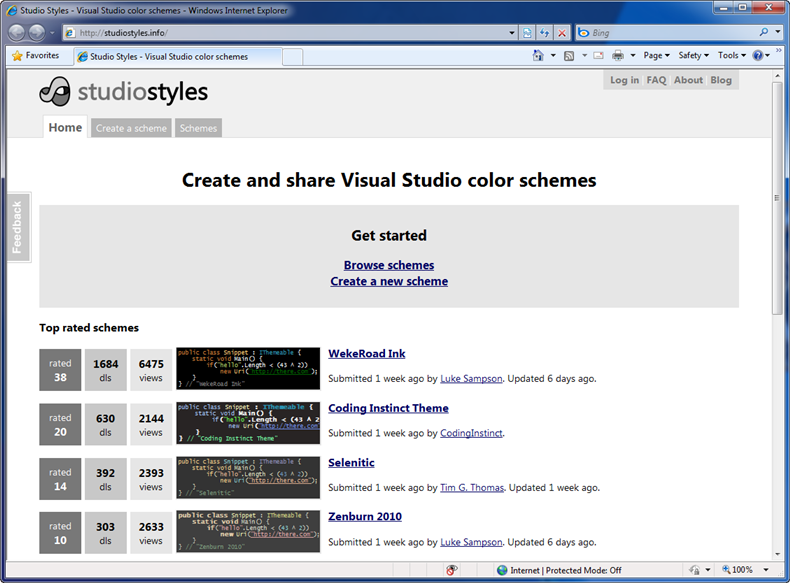 Check out my VS 2010 and .NET 4 blog series for more details on some of them. 6 Cool VS 2010 Quick Tips and Features: Anoop has a nice blog post describing 6 cool features of VS 2010 that you can take advantage of. SharePoint Development with VS 2010: Beth Massi links to a bunch of nice “How do I?” videos that that demonstrate how to use the SharePoint development support built-into VS 2010. How to Pin a Project to the Recent Projects List in VS 2010: A useful tip/trick that demonstrates how to “pin” a project to always show up on the “Recent Projects” list within Visual Studio 2010. Using the WPF Tree Visualizer in VS 2010: Zain blogs about the new WPF Tree Visualizer supported by the VS 2010 debugger. This makes it easier to visualize WPF control hierarchies within the debugger. TFS 2010 Power Tools Released: Brian Harry blogs about the cool new TFS 2010 extensions released with this week’s TFS 2010 Power Tools release. 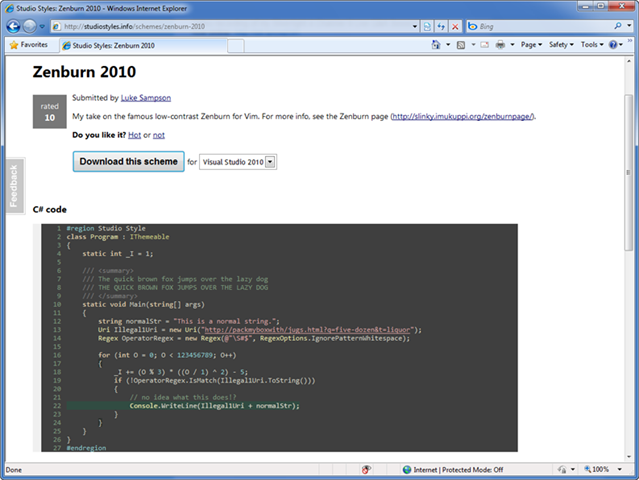 What is New with T4 in VS 2010: T4 is the name of Visual Studio’s template-based code generation technology. Lots of scenarios within VS 2010 now use T4 for code generation customization. Two examples are ASP.NET MVC Views and EF4 Model Generation. This post describes some of the many T4 infrastructure improvements in VS 2010. P.S. If you haven’t already, check out this month’s "Find a Hoster” page on the www.asp.net website to learn about great (and very inexpensive) ASP.NET hosting offers. IIS Install Registry Key is missing. I could see from this that the issue was actually with IIS and not with a missing copy of the ESB guidance. From this we were able to determine that the IIS 6.0 extensions were not installed on the Windows 2008 system. Once the client installed those, the configuration ran properly. This is certainly an error message that needs updating, hopefully you won’t be caught by it. So you set the credentials and continue and you are ready to go. As developers we often spend a large part of our day staring at code within Visual Studio. If you are like me, after awhile the default VS text color scheme starts to get a little boring. The good news is that Visual Studio allows you to completely customize the editor background and text colors to whatever you want – allowing you to tweak them to create the experience that is “just right” for your eyes and personality. You can then optionally export/import your color scheme preferences to an XML file via the Tools->Import and Export Settings menu command. Luke Sampson launched the http://studiostyles.info/ site a week ago (built using ASP.NET MVC 2, ASP.NET 4 and VS 2010). Color schemes are sorted by popularity and voting (you can vote on whether you find each “hot or not”). You can also optionally upload color schemes of your own if you have a good one you want to share with others. If you haven’t visited it yet – check it out: http://studiostyles.info/ And thank you Luke Sampson for building it! ATTENTION: Windows Azure platform AppFabric has transitioned to commercial availability on April 12th 2010, and is now a fully SLA-supported paid service. Customers who use AppFabric will be notified of their usage, as charges have begun accruing as of 11:00 PM (UTC) on April 12, 2010.